We’d love your help. Let us know what’s wrong with this preview of Healing Of The Heart by Loree Lough. To ask other readers questions about Healing Of The Heart, please sign up. Healing Of The Heart by Loree Lough is a delightful Christian historical romance. It is the third book in the Secrets On Sterling Street but can be read as a stand-alone. I thoroughly enjoyed it. There are many themes in the novel including that of faith and trust in God. God gave us free will but we need to trust Him as His plans are so much greater for us than our own. We especially need to trust Him when the road ahead is unclear. Prayer is important. Prayer is communing with God. We need to th Healing Of The Heart by Loree Lough is a delightful Christian historical romance. It is the third book in the Secrets On Sterling Street but can be read as a stand-alone. I thoroughly enjoyed it. Prayer is important. Prayer is communing with God. We need to thank Him for our food and bring our petitions and thanks to Him daily. I found the prayers of the young children at bedtime particularly touching. The novel deals with the themes of appearances and judgment. Often we are too quick to judge by external appearances when we really need to look at people's hearts and not judge at all. Ruby and her mother Cordelia are on a road trip to heal hearts. They are trying to right the wrongs of Ruby's father. Sometimes their open handed generosity is viewed with suspicion. They seem to be trying to get restitution with their good deeds. The reader is reminded that we cannot work our way into God's good books. We are welcomed by God because of grace and the sacrifice of Jesus. The theme of guilt runs throughout the novel. The weight of her father's sins weighs Ruby down but it is not her burden to carry. "Pray about this guilt you feel... because it isn't yours to carry." We need to hand our burdens over to God. The tale has the theme of taking care of the widows and orphans. We need to provide care for and speak up for those without a voice. There is a wonderful feeling of community within the novel. In times of crisis the whole town pulls together. There is an undercurrent of romance bubbling away beneath the surface. It is delightful to watch it unfold. The characters are all endearing. I loved the way Ruby and Rex bounced off each other. Orphans Peyton and Arlo were delightful. And Mavis had a wonderful air of warm hospitality about her. Healing Of The Heart was my first novel by Loree Lough and I absolutely loved it and devoured it. Loree Lough writes with warmth and humour. I can certainly recommend Healing Of The Heart and I intend to hunt out more novels by Loree Lough. Fairplay is a small, peaceful town in Colorado. The book is set during the time of the Old West where a sheriff tried to safeguard his town against outlaws and gangs. The sheriff in Fairplay is Rex Truitt. He wants to keep all illegal elements out of his town and his suspicions are set upon wealthy Ruby McCoy and her mother. Who knows if they have come to scam the community? He knows there is a secret and is determined to find it. Ruby has a heart of gold. She and her mother have set upon their j Fairplay is a small, peaceful town in Colorado. The book is set during the time of the Old West where a sheriff tried to safeguard his town against outlaws and gangs. The sheriff in Fairplay is Rex Truitt. He wants to keep all illegal elements out of his town and his suspicions are set upon wealthy Ruby McCoy and her mother. Who knows if they have come to scam the community? He knows there is a secret and is determined to find it. I loved that Rex and Ruby are strong characters with a strong moral code. Both have their secrets from their past that motivate them to good. Their pasts are connected and they have the potential to help each other heal. The town is made up of a lot of characters. It was fun to get to "know" them as I turned the pages. I really enjoyed the dynamics of the town and the people who populate it. This book is the third in a series. I had not read the first two, but I felt as if I followed along with the dynamics and the town without reading the first two. I think it would be fun to read the others and see what I missed. After inheriting her father's estate and wealth—blood money, really—Ruby McCoy comes up with a plan to use it for good. According to her plan, the next several years Ruby and her mother, Cordelia, travel across the country with one goal—to right the wrongs her deceased father had done to so many and healing their hearts. Will her own heart be healed in the process? Finally in 1884 they arrive in Fairplay, Colorado...their last designation. Sheriff Rex Truett feels sure Ruby has a secret and is determined to learn what it is and how it will impact the citizens of Fairplay. Oh, but he did not count on Ruby capturing his heart. When a Typhoid epidemic breaks out, Ruby works endlessly along side the doctor to help ease their suffering. Rex inadvertently overhears the secret Ruby has been hiding and is shocked with what he learns. Can he forgive her and what of his own secret? Can there be a future for them after what he learned? Will Ruby ever feel worthy, even after righting the wrongs her father did? Healing Hearts is the third book in the series and my favorite. Ruby, Rex and Silas are a few of my favorite charters. Mustn’t forget Reverend Crutchfield, Dr. Wilson and his wife Janet. I really like Carlos and Nora and some of the other secondary characters. I love the homey feel of this little town and their sense of community and family. I appreciate the spiritual elements woven within the story—lessons of God's love, forgiveness and our worth comes from God not our own striving. Another wonderful read by Loree Lough. This beautiful novel will sweep readers into Fairplay along with wonderful new characters like Ruby and Cordiela McCoy. Two people who want to right right a wrong. Rex Truett is someone who has gone through a lot himself since he was a boy. Even though I thought he was the perfect man of my dreams! And sheriff of Fairplay to boot! I enjoyed this novel to a tea! It was worth waiting for! When I seen that our book club had it up for review I knew I just had t Another wonderful read by Loree Lough. This beautiful novel will sweep readers into Fairplay along with wonderful new characters like Ruby and Cordiela McCoy. Two people who want to right right a wrong. I enjoyed this novel to a tea! It was worth waiting for! When I seen that our book club had it up for review I knew I just had to grab this one. I laughed through most of it and I hd my breath through some of it. Silas is as I remembered from the last story up to his sneaky tricks and he had the most caring side to a man that I wish all men for! I would've loved Mavis for an Aunt. Even though she was sort of rough around the edges she really had a soft heart. I could almost hear her scold Rex for whatever it was he did. I liked Rex from the beginning and thought he'd be perfect for a certain someone if she'd let go of her stubborn ways! Ruby is a lady who wants to right the wrongs her father has done to the good people of Fairplay and wherever else he had done. This was a great book, kept me interested right from the beginning. So much so that my husband came in for lunch and I totally didn't even hear him. It kept me so interested I couldn't put it down and kept reading till I had it read the same day (stayed up till midnight), and I don't do that often. Can't wait for the next one from this author as each book seems to just get better and better. Ruby feels tremendous guilt and responsibility for the crimes her father committed on so many innocent lives, and she feels that she needs to repay all those innocent people. How can one young woman ever repay people for such incredible losses? And she plans to do it in secret. They will never know her true identity as she plans to use her mother's maiden name. Her mother intends for Ruby to be adorned at all times so that she can catch her dream man and start a family. She is well on her way to Ruby feels tremendous guilt and responsibility for the crimes her father committed on so many innocent lives, and she feels that she needs to repay all those innocent people. How can one young woman ever repay people for such incredible losses? And she plans to do it in secret. They will never know her true identity as she plans to use her mother's maiden name. Her mother intends for Ruby to be adorned at all times so that she can catch her dream man and start a family. She is well on her way to completing her mission when they finally arrive in the final town of Fairplay, Colorado. She and her mother have also found a town where they feel they can permanently live, but there's a sheriff in town and while Ruby finds him quite attractive, he finds her quite suspicious. He is harboring his own secrets, and is busy with his own responsibilities but that doesn't stop him from his mistrust of Ruby. What will come of Ruby and Rex's interactions? Can they both live cordially in the same town? Readers must read the book to discover answers to these questions and more. I love historical fiction and Loree Lough has mastered the art of capturing the old world charm and danger of the 1800's. I have a fascination with this time period and simply cannot imagine having a "Old West Robber" for a father. I definitely cannot imagine my father being hung in a tree for his crimes. I most definitely cannot imagine inheriting all that "dirty money" but I do see the desire to "donate" the money by doing good in the places where my father created such loss and fear. Ruby is a character I greatly admired as I read the book due to her exemplary character and goodness. I felt as if I were traveling along with Ruby as she sought to correct the wrongs of her father. This book is the third in a series and while I have not read the previous two books in the series, I was able to follow along and did not notice information missing that was important to my comprehension of the story. I would love to read the entire series now though. I rated this book 5 stars and highly recommend it to readers of historical fiction. I picture this town as a very close knit place where people really care about each other.......... When Ruby McCoy and her mother moved to Fairplay -- they were running from something and to something at the same time. Ruby and her mother were rich, privilaged and could be considered spoiled. Ruby thought she had a score to settle because of what her father did to the town. So many times, we feel responsibe for other peoples' actions and we want to "Fix" the problem. In reality, only God can set I picture this town as a very close knit place where people really care about each other.......... When Ruby McCoy and her mother moved to Fairplay -- they were running from something and to something at the same time. Ruby and her mother were rich, privilaged and could be considered spoiled. Ruby thought she had a score to settle because of what her father did to the town. So many times, we feel responsibe for other peoples' actions and we want to "Fix" the problem. In reality, only God can settle other peoples scores. Rex's father is a victim of Ruby's father's "fun times." When Ruby gets to town, he is the sheriff and instantly suspects she has a huge "Secret." He has some secrets of his own that he doesn't want revealed. When he learns her "secret" his first instinct is to resent her because of who her father was. A lot of times we blame the wrong person for things that are done to us.......... We should put the blame where it belongs. Rev. Crutchfield is a really nice man -- he is like a grandfather to the whole town. He is loved by everyone. Janet Dowell Wilson is married to Amos Wilson, MD. She is the librarian in Denver, CO. and helps start a library in Fairplay. Everyone loves her and she loves everyone. Her First husband, Brad Sinclair, passed away several years ago and it took a little while for her to love again. Now she is very happy and she & Amos are expecting their first child in February. "Healing Of The Heart " is another wow book. It is the third in the "The Secrets of Sterling Street "series. I think it is the best one of the three. The other two are good but "Healing Of The Heart" leaves me wanting to read about these characters. This book can be read as a standalone and if you don't read the other two you don't miss any of the story. The stories are all separate but there are a few characters that are in all three books but again I say they are all separate stories. "Healing "Healing Of The Heart " is another wow book. It is the third in the "The Secrets of Sterling Street "series. I think it is the best one of the three. The other two are good but "Healing Of The Heart" leaves me wanting to read about these characters. "Healing Of The Heart" is a book that pulled at my heartstrings. This story is a tale about how a person's actions affects more than the person doing the actions. This novel is a perfect example of how secrets can really damage a person and how they eventually come to the Light. "Healing Of The Heart" isn't a feel good book at the start, the reader is swept into Rudy's fear of people finding out who her father was, a murderer and a thief, and why she was doing all the good deeds. Rudy finds out her family isn't the only one with secrets. Can love survive all the secrets. And what is going on with the traveling actors, are they really who they say and why is the whole town in danger? "Healing Of The Heart" is a story of love and forgiveness and learning that a person isn't responsible for other's actions. All three of these books are lessons in what love is and what it does! I have given "Healing Of The Heart" by Loree Lough as well as the other two books "Currency of the Heart" and "Guardians of the Heart" five stars. I was given a complementary copy by the author and Celebrate Lit. These opinions are my own. After the hanging of her father for robbing a bank and killing several people in his path, Ruby McCoy finds out she inherited all of his blood money. Determined to help all who suffered at her father’s hands, Ruby hits the road to all of the towns her father left suffering. When she arrives in Fairplay and meets Rex Truett, feeling she didn’t expect surfaced. Can she come clean with the town cop? I really enjoyed this sweet story. Ruby was so torn over her father’s life, and it was heartwarming to see her determination to help all that he had hurt, which was no easy task. Ruby was such a sweet character. But Ruby’s mom was a different story. She really got on my nerves because she could have cared less about her husband’s evils, as long as she could live her pampered life. I’m not sure I would have handled her as calm as Ruby did! Loree Lough does a nice job of creating characters that develop well throughout the story. The scenes were very detailed, the plot interesting and intriguing. If you enjoy historical fiction, I highly recommend this book for a few hours of entertainment and enjoyment. Even though I didn’t read the first two books in this series, it was still and ok book for a standalone! The story starts with the reader being privy to Rex’s thoughts which are really rather mundane but escalates with a bang. I was drawn to Rex because of his admiration and love for his father, and Aunt Mavis. By the first description he appears to be honorable and respectable. What was the first thing that connected me to Ruby McCoy? It was not the setting, as that is during the year 1879. Perhaps it was because she was thrust into a position of executor of her father’s will which she did not want. Or because she and her mother lived together, or that she was fatherless. Ruby has a heart as big as Canada, though the majority of the story takes place in Colorado. Sometimes I find it hard to accept that I really do not have to earn love or forgiveness, but I think that it might be a universal feeling to us humans. Following Ruby on her journey was a treat. Thi novel i full of relationships to be explored. Parent and child. Adoption. Neighbors, and of course romantic. There were surprises and the story flowed easily with enough conflict between characters to keep me turning pages. Although it is a regular size book. I finished it in a day of intense reading. Loree Lough is a well loved author of mine, and I have read most of her novels, but I think it is her best one yet. A heartwarming story about the daughter of a thief who is trying to right her father's wrongs. It is the third book in the series and I had not read the first two, but I had no problem reading it as a stand alone. Ruby is a wonderful, generous heroine who is carrying a load of guilt about her father's sins. I loved her warm and sincere personality. And Rex is a great hero - in taking care of his aunt and two orphans, he shows he's a caring and loyal person. When these two meet, they both have se A heartwarming story about the daughter of a thief who is trying to right her father's wrongs. It is the third book in the series and I had not read the first two, but I had no problem reading it as a stand alone. Ruby is a wonderful, generous heroine who is carrying a load of guilt about her father's sins. I loved her warm and sincere personality. And Rex is a great hero - in taking care of his aunt and two orphans, he shows he's a caring and loyal person. When these two meet, they both have secrets. When these secrets come to light, they both have to learn to forgive, themselves and each other, and to put their faith and trust in God. The secondary characters were also well written and add a great background to this story. You just have to roll your eyes, chuckle and shake your head when reading about Ruby's mom. And Aunt Mavis and the orphans are delightful. Several of the characters in town add warmth and humor. And there was a great sense of community as the town pulls together in a time of crisis. A sweet inspirational romance with themes of forgiveness, restitution, redemption, and compassion and care for orphans and the sick. You'll enjoy this historical romance set in the west. Loree Lough has written a delightful and charming historical romance that readers will love. From page one, Lough pulls readers in with a bit of thievery and action. As the story progresses, readers will fall in love with Ruby McCoy as she attempts to pay for and right the wrongs of her thieving and murderous father. This is a heartwarming story that will capture the emotion of readers and keep them captivated until the very end. I would recommend this excellent story to readers that enjoy histo Loree Lough has written a delightful and charming historical romance that readers will love. From page one, Lough pulls readers in with a bit of thievery and action. As the story progresses, readers will fall in love with Ruby McCoy as she attempts to pay for and right the wrongs of her thieving and murderous father. This is a heartwarming story that will capture the emotion of readers and keep them captivated until the very end. I would recommend this excellent story to readers that enjoy historical romance. Deb’s Dozen: Ruby Works to Repay Father’s Debts—Sheriff Truett is Suspicious—Enter Romance. Loree Lough has written another lovely romance. How she manages to come up with new and different characters and situations continually amazes me. Healing of the Heart is a delightful story of regret, reparations, and romance. Ruby McCoy and her mother are new to Fairplay and immediately move into the newly renovated, biggest mansion in town. No one knows anything about them except their advance man has arr Deb’s Dozen: Ruby Works to Repay Father’s Debts—Sheriff Truett is Suspicious—Enter Romance. Ruby McCoy and her mother are new to Fairplay and immediately move into the newly renovated, biggest mansion in town. No one knows anything about them except their advance man has arranged for all the work and furnishings they require. Ruby knows she’s there to repay the debts her outlaw father incurred and to right the wrongs he did when he and his gang ravaged the town. Her mother, who fancies herself a society lady, still does not understand what drives Ruby to these actions. They both are relieved Fairplay is the last town they’ll have to visit/live in to fulfill their mission. Sheriff Rex Truett is suspicious of the new folks in town. Since there is little information about the ladies, he is insatiably curious as to their background and reasons for moving to Fairplay. He is puzzled by Ruby. Why does a woman who can afford the biggest mansion in town do much of the work around the house? How does a society lady know how to get stains out of clothing for example, much less how to stack wood? These two characters are fairly believable, but the most delightful character is Ruby’s mother, Cordelia. She’s so prim and proper, yet amusingly droll. To keep her in line, Ruby pays her an allowance so she can buy ribbons and hats and other fripperies. You can guess the ending at the beginning, but how things come about is an interesting read—not your usual romance. The book itself is attractive, with a glossy cover and lovely cream paper. I’d give Healing of the Heart 4 stars. Loree Lough is an ultra-prolific writer with “nearly five million 4-and 5-star books in circulation.” Healing of the Heart is the third in the Secrets on Sterling Street series. Loree lives in Baltimore and enjoys her “grandorables” along with the rest of her family, She is as personable as her characters or more so, and she loves interacting with her fans on Facebook, Twitter, and Pinterest. She also answers every email sent to Loree@LoreeLough.com personally. I admit it. I've become addicted. Loree Lough's books have found their way into my reading habit to become a "must have" instead of an "I'd think I'd like to read this." This one is a historical romance, and one I think guys would also enjoy because it's got a man's man in it. Rex Truett joins the police force instead of his chosen money-making career in the hotel business. Why? Because he wants revenge on that heartless owlhoot, Verdell Lundgren, who killed his pa. Eventually, he winds up in Fai I admit it. I've become addicted. Loree Lough's books have found their way into my reading habit to become a "must have" instead of an "I'd think I'd like to read this." This one is a historical romance, and one I think guys would also enjoy because it's got a man's man in it. Rex Truett joins the police force instead of his chosen money-making career in the hotel business. Why? Because he wants revenge on that heartless owlhoot, Verdell Lundgren, who killed his pa. Eventually, he winds up in Fairplay, Colorado, with his Aunt Mavis and two children made orphans by Verdell. Verdell's daughter and wife, Ruby and Cordelia McCoy (Cordelia's maiden name), also land in Fairplay, but for much different reasons. Ruby is so ashamed of her father and the evil deeds he did that she spends his ill-gotten gains on restoring as much as she can to those he harmed. Fairplay should be the last stop on that mission. Cordelia assumes the persona of a society matron while Ruby rolls up her sleeves and goes to work. A generous allowance for Ruby's mother keeps her in new gowns and jewels and happily out of Ruby's hair most of the time. Of course Rex and Ruby are destined to meet. But each of them withhold secrets, and those secrets ensure they will not see any fruition of the attraction they both feel. You could help them out, you know. Buy the book. Whisper in Rex and Ruby's ears wise advice. You know how it should end, but they obviously don't. 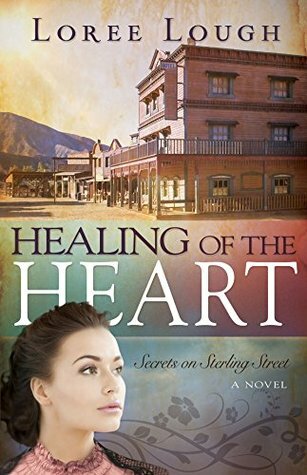 “Healing of the Heart, Secrets on Sterling Street,” by Loree Lough is a work of historical fiction. This is easy to read, clean and deals with topics of forgiveness and trust. The story begins in 1879, in a time when people had integrity and accepted responsibility for their actions. Most of the story takes place in a small town, Fairplay, Colorado. Ruby, our main character, has inherited her father’s fortune. Sadly, his wealth appears to have come from his life of crime! Ruby’s new goal in life “Healing of the Heart, Secrets on Sterling Street,” by Loree Lough is a work of historical fiction. This is easy to read, clean and deals with topics of forgiveness and trust. The story begins in 1879, in a time when people had integrity and accepted responsibility for their actions. Most of the story takes place in a small town, Fairplay, Colorado. Ruby, our main character, has inherited her father’s fortune. Sadly, his wealth appears to have come from his life of crime! Ruby’s new goal in life is to right the wrongs that her father committed. She decides to travel, helping out families, paying all of them back, for what her father had stolen through his many years of criminal living. Healing of the Heart is book three in Loree Lough's Secrets of Sterling Street series. This is a great book that I really enjoyed reading. Loree's writing style is one that will have you hooked. A story of love, redemption and healing, Healing of the Heart is one you will not put down until you have read every word. Even though it is part of a series, this book can be read as a stand-alone. The only thing Ruby McCoy wants to do is to right her father's wrongs. She and her mother move to FairPlay Healing of the Heart is book three in Loree Lough's Secrets of Sterling Street series. This is a great book that I really enjoyed reading. Loree's writing style is one that will have you hooked. A story of love, redemption and healing, Healing of the Heart is one you will not put down until you have read every word. Even though it is part of a series, this book can be read as a stand-alone. The only thing Ruby McCoy wants to do is to right her father's wrongs. She and her mother move to FairPlay and move into the biggest mansion in town. Ruby's father was a notorious gangster who was hung five years ago. She uses the "blood money" her father left her to help out those who need it. Sheriff Rex Truett doesn't trust Ms. McCoy and is determined to find out her story but when a cholera epidemic strikes the town, he has to rethink his actions. Ruby has no intentions on falling in love but that all is about to change. What about her secret, will she win Rex's heart or will he turn his back on her? Loree Lough appeals straight to the heart in this book. The plot in this book was brilliantly done. It and the storyline are really what got me first. A daughter trying to make up for her father's misdeeds by helping those he hurt is brilliant, and Ruby McCoy is just the right kind of character to pull it off. Both main characters are written so well, and reading how the daughter intends to help others truly does touch the heart. Will she ever be free of the guilt?? With vivid characters, a wonde Loree Lough appeals straight to the heart in this book. The plot in this book was brilliantly done. It and the storyline are really what got me first. A daughter trying to make up for her father's misdeeds by helping those he hurt is brilliant, and Ruby McCoy is just the right kind of character to pull it off. With vivid characters, a wonderful story, and a lovely historical setting this is a wonderful book that will be on my forever shelves. I highly recommend this read! Healing of the Heart by Loree Lough is a thoroughly enjoyable "clean" read. Set in the late 1800s, it is a story of secrets, righting wrongs, trust, faith, family and love. Rich scenery, historically accurate detail and well-developed characters make the book a winner. It is Book 3 in the Secrets on Sterling Street series, but can be read as a stand-alone novel. I definitely plan to read more books by this author. I received a complimentary copy of this book from the publisher through The Book Cl Healing of the Heart by Loree Lough is a thoroughly enjoyable "clean" read. Set in the late 1800s, it is a story of secrets, righting wrongs, trust, faith, family and love. Rich scenery, historically accurate detail and well-developed characters make the book a winner. It is Book 3 in the Secrets on Sterling Street series, but can be read as a stand-alone novel. I definitely plan to read more books by this author. I liked this book very much. It was about forgiveness and trying to live up to others expectations of you. Ruby felt Rex wouldn't love her when he found out abut her father's sins. She tried to make up for what he did. Light, easy read. It had good flow to the chapters and was easy to follow. I first read a Loree Lough book in my late teens or early twenties, when I was subscribed to Barbour’s Heartsong Presents line. I still have one of them, The Wedding Wish, on my shelf, in fact. So I was excited to read Healing of the Heart, one of her more recent releases. And while I enjoyed it, there were a few decisions regarding the resolution of the story and the characters’ actions that made me unable to give this book as high a grade as I wanted to. I want to be clear that I am recommendin I first read a Loree Lough book in my late teens or early twenties, when I was subscribed to Barbour’s Heartsong Presents line. I still have one of them, The Wedding Wish, on my shelf, in fact. So I was excited to read Healing of the Heart, one of her more recent releases. And while I enjoyed it, there were a few decisions regarding the resolution of the story and the characters’ actions that made me unable to give this book as high a grade as I wanted to. I want to be clear that I am recommending Healing of the Heart to those who like Christian historical romance despite a few personal nitpicks! Healing of the Heart is centered on Ruby McCoy, whose father is a bank robber who is hanged early in the book. She spends the next few years spending all the money he left her and her mother in the towns he robbed, in order to assuage her guilt over her father’s actions. She has now come to Fairplay, Colorado, which is to be their last stop before she can move on with her life. The hero is Sherriff Rex Truett, and he is a good hero. He’s smart, and initially has suspicions about Ruby and her mother because of their frequent traveling and ability to pay cash for a huge mansion in Fairplay. But eventually he realizes that behind Ruby’s money is a genuinely good heart and he begins to fall for her. This is one of my problems with the book. Ruby is spending her father’s money to help people and while she thinks it’s to help others who have been hurt by her father, it’s actually because she’s a good person. Ruby, when the entire town and your family is telling you you’re a good person, listen to them! She spends a large majority of the book ignoring that her actions are motivated by her good heart, not guilt. It may have started as guilt, but years later it is because she genuinely enjoys helping people. And her insistence that she’s not good enough for Rex (because of her father’s career and what her father did to his), is one of my biggest pet peeves in fiction. Ruby was a little too self-sacrificing in my opinion. Rex was a little too perfect and I felt he forgave two big secrets more easily than I expected for how he’d been presented as a character in the majority of the book. The romance had plenty of conflict between the hero and heroine so I felt the outer conflict of the cholera epidemic was a little tacked-on to try to make the story more exciting but I do not feel it was necessary. The story was interesting and enjoyable without it. The city of Fairplay feels like a real place, with the setting excellently drawn and doesn’t merely serve as a backdrop for the action. The secondary characters are not simply there to prop up the main characters but all have motivations and desires of their own. I especially love Silas, who is Ruby’s “scout” and has become a part of the family. I give this book 4/5 stars for the excellent writing, the detailed setting, the secondary characters who are not merely caricatures or cardboard, and the message of who is responsible for someone else’s sin. I took away one star for the lateness of the reveal between Ruby and Rex about what her father did to his and for how I disliked a few major aspects of both the hero and heroine. If a quick resolution or the characteristics mentioned above as part of Ruby and Rex do not bother you, you will enjoy the ending of this book more than I did. Healing of the Heart is the third book in a series but they are all standalones. I will most likely try more books in this series and others available by Ms. Lough. I recommend this book to anyone looking for a romance that has a wonderful message about guilt and family, great secondary characters, and an excellent setting. Things have changed since Ruby has come to right a wrong, several wrongs. Repaying what has been deprived of others, Ruby hopes to heal her heart and memories she would like to be different. Will she be believed or questionable motives be suspected? Going by her mother's maiden name, Ruby's travels bring her to a small town named Fairplay, of all things. Certainly, this will right itself! To right a wrong. Forgiveness. Not carrying another's offenses making them your own. Delivered from the penalty of sin by choosing Christ to be your forerunner, your Deliverer. For He will. As Ruby seeks to replace pain caused by another, her heart is replaced by longing to be freed from the crushing weight ~ of regret, of sorrow, of loss. Love is hidden beneath supposed strength, a weakness that obliviated all that could have been. Can it be recouped, restored? Refreshed ~ a loss brought forward to be replaced by a Love never before aware nor received. I am here for you. Always. I walk alongside you. You are not alone nor forgotten. You are whole in Me. Receive all that I have for you and do not fear. My love covers a multitude of sin and neglect. Rebuilding that only can be new and fresh, not stirred up in remembrance of what once was. Sheriff Rex Truett has tried hard to keep the town of Fairplay in Colorado a safe place for the residents, and for his heart... keeping it intact, while sheltering it from added storms. Losing his father at a young age, he has wanted to explore loving with open hands ~ free to give and to receive. He and his aunt have taken in two children to keep them from harm. When Ruby and her mother arrive in town, he has difficulty trusting their intent. Repairs to buildings, service to those nearby, silently has misgivings to him as to motive. Why would strangers want to help those in need in Fairplay? In the process of rendering aid, Ruby and her mother find healing in their hearts and worth. Secrets revealed free them from disaster and injured hearts and lives. There comes a stopping off place, a place to accept who they truly are ~ loved and whole. On the healing tour, heavy hearts are lightened by truth. Healing of the Heart by Loree Lough deals with some issues that can be very true to our lives. Ruby, the main character, struggles with blaming herself for the actions of her criminal father and spends years of her life trying to atone for his evil deeds. We can often be drawn into that place in our lives where we blame ourselves for something over which we have no control, and at times, for someone else’s actions. Ruby also battles with the decisions she’s made and the subterfuge she’s engaged Healing of the Heart by Loree Lough deals with some issues that can be very true to our lives. Ruby, the main character, struggles with blaming herself for the actions of her criminal father and spends years of her life trying to atone for his evil deeds. We can often be drawn into that place in our lives where we blame ourselves for something over which we have no control, and at times, for someone else’s actions. Ruby also battles with the decisions she’s made and the subterfuge she’s engaged in in an attempt to right her father’s wrongs and not let anyone know her connection to him. The author works to show us just how hard it is for Ruby to overcome these things and to believe good about herself even when she has people constantly trying to tell her about all the good they see in her. The author also addresses how an attitude of vengeance can affect your life through the character Rex. I really wanted to see both characters freed from those struggles. While the author does deal with these issues, I felt like they could have been better developed and done in such away that better showed the progression of the characters out of those thought processes and beliefs. As it is, the characters seem to struggle with those things right up until the very end with not much sign of them changing their thought patterns and so it made the “change” difficult to believe. I struggled a little to relate to the characters and found their actions and thoughts to be somewhat frustrating at times. I also spent a good deal of the book wondering if I was missing something regarding different events and aspects in the story. Information was often delivered in such a way that I was surprised by it and wondering when it had happened. Not enough detail was given to explain many of those situations in a satisfactory manner. At times, the format made things hard to follow (I may have had an unedited version which could have contributed to that and the final version may flow better). The book also deals with a small cholera outbreak in the town of FairPlay, and I have to say, that though there were some things about the book I didn’t care for, I was impressed by what seemed to me to be a pretty realistic portrayal of the outbreak and the depths of care needed to help those affected overcome it and prevent the further spread of it. While this book is not one of my favorites, some of the things that were an issue for me may not be an issue for a different reader. What would you do if you had a father who was a thief and killer? Would you try to hide your identity from other people? I know we don't get to pick who our parents are, and that is exactly what Ruby faces in this unforgettable story of redemption , secrets and trust. After Ruby's father is hanged for his crimes, Ruby is stunned to find out that he has left her a very wealthy woman. I think at first she had a hard time taking the fortune because she knew how it was obtained. What would you do if What would you do if you had a father who was a thief and killer? Would you try to hide your identity from other people? I know we don't get to pick who our parents are, and that is exactly what Ruby faces in this unforgettable story of redemption , secrets and trust. After Ruby's father is hanged for his crimes, Ruby is stunned to find out that he has left her a very wealthy woman. I think at first she had a hard time taking the fortune because she knew how it was obtained. What would you do if you inherited money that you knew was tainted? I found Ruby's character was very interesting and heartfelt. She wants to do the right thing and make amends to all the families her father hurt. It was a big task but her heart was so broken by her father's wrongdoing she needed to lessen the pain she felt in her heart. She knew this is what God wanted her to do. I loved the story and found it to be a great lesson in forgiveness and healing. Her heart must have been crushed to learn of the evil doings her father did. Was Ruby feeling guilty and somehow taking responsibility for her father's sins? When Ruby and her mom travel to FairPlay, Colorado to continue using the inheritance there seems to be a bit more to do in this town that will be a big challenge for them. Rex Truett is the sheriff of the small town and is a bit suspicious of Ruby and her mom. He is a very strong character and I loved his unconditional love for the two children he was taking care of. Ruby and Rex sure don't see eye to eye at first. I'm not sure who was more stubborn but it sure made for many encounters with each other that were tension filled. Rex has to be asking himself " Why would a beautiful woman and her mom travel to a town where they know no one with the intentions to improve the town? " The story is very well written and flowed at a nice pace. There are others in the town that will add a bit of intrigue to the story. There are many surprises and secrets that have people wondering who they can trust? Will Ruby be able to let go of the shame of her father's sins? Can Rex find a way to trust again? The story is filled with a glimpse into the lives of people who have trust issues, guilt, insecurity and learning to love again. "When we're hurting, we have a choice , too. We can get all mad and mean, or go to God for comfort and strength." Ruby McCoy is haunted by her father's sins....When Ruby McCoy arrives in Fairplay, her ornate carriage is followed by an entourage who heft steamer trunks, hatboxes, and traveling bags into the hotel, where she has booked the entire second floor. Upon her notorious gangster father's death, the now-wealthy Ruby, hiding under her mother's maiden name, set out to right her father's wrongs. Ruby is determined to spend every penny of the inherited "blood money" on those who paid the price for her father's crimes.Sheriff Rex Truett doesn't trust Ruby and doesn't care who knows it. The keeper of Fairplay's law and order makes it his business to find out why a stranger; especially a beautiful, spoiled, rich, female stranger; would set up businesses, donate to schools, hire workmen to rebuild houses, and provide access to the best medical care. But when a typhoid epidemic sweeps through the city, he is forced to reconsider. Will Rex blame Ruby for her father's sins? Or will he accept the possibility that she is trying to create; and feel; the peace her father stole? I love the time period that Healing of the Heart is set in. I watch any and all movies, television shows, and read books that take place during that time period. Poor Ruby, I see her immediately as a girl that is misjudged on many different levels and feels like she has to fix all her father's mistakes. It must be a terrible life to have to live in such a way. Fairplay, Colorado seems the place for Ruby McCoy to set her hands at just that. It's not long before she is taking inherited money and doing a lot to help the people of Fairplay and help the town, overall. The dynamic between Ruby and Rex shows through in their interactions and its plain to see that Rex is a little annoyed with Ruby but its not long until he has to relies on her more than he wanted to. This was the first time I read any writings from the author but I absolutely fell in love with the two main characters and the way they played off of each other. It was definitely a strong story line so it could stand on its own but I would really like to see how this series plays out. Love the story and the rich characters. New authors excite as I don't know what to expect. Will I want to finish the book? Will I be sad when I turn to the last page? This book was the first book I ever read by this author. I saw it was Book 3 and was prepared to be confused and bewildered for awhile. But I was able to catch on pretty quick and could figure out what Ruby McCoy was all about. Ruby felt responsible for her father's actions. She was trying to pay back to all the people who were harmed by her father. She travelled New authors excite as I don't know what to expect. Will I want to finish the book? Will I be sad when I turn to the last page? This book was the first book I ever read by this author. I saw it was Book 3 and was prepared to be confused and bewildered for awhile. But I was able to catch on pretty quick and could figure out what Ruby McCoy was all about. Ruby felt responsible for her father's actions. She was trying to pay back to all the people who were harmed by her father. She travelled from city to city to accomplish this goal. She was afraid to let anyone know who she was as she knew that she would be shunned and thrown out of town. She kept her identity a secret. She arrived in Fairplay to try to erase her guilt. She sensed that Fairplay was different. She felt like she belonged there. It didn't hurt that she was attracted and interested in the town's sheriff, Rex Truett. Rex took care of his aunt and two orphan children. He wanted to protect them from any harm. He wanted to adopt the children but he had two strikes against him. He was single and he had a dangerous job. He was the sheriff. He became the sheriff of Fairplay after his father was killed by a villain. He felt guilty that his father was at the bank (the scene of the crime) because of him. It was his fault that his father was there in the first place. Ruby and Rex made life decisions on their feelings of guilt. Neither were guilty of anything but took it upon themselves anyway. This guilt dictated their decisions. Rex and Ruby fell in love but also learned that no matter what they did the feeling of being responsible of something they had no control over could never go away. They had to learn to allow themselves to feel God's love and understand what they can and can not control. With this new understanding, they were to able to turn to each other and grab on to the happiness they both deserved. Great book. I received this book free to review. I highly recommend the book as well as the series Secrets on Sterling Street.